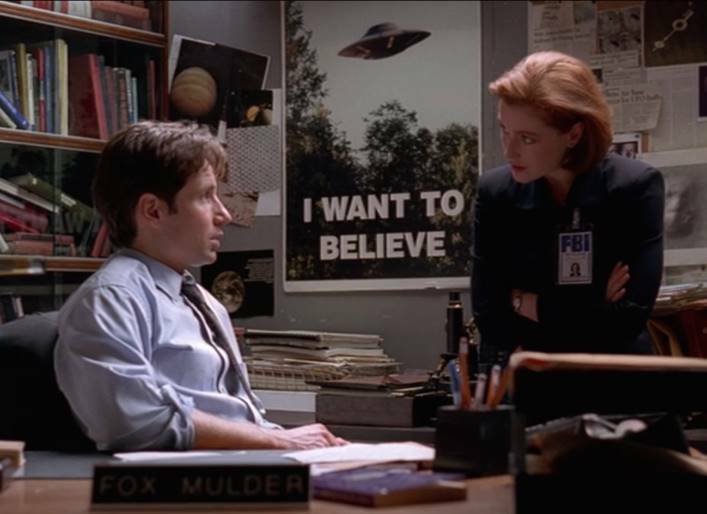 Mulder with that poster and a picture of Saturn with a moon behind his head. It’s Easter, that time of year when millions of Christians celebrate Christ’s resurrection. Now I’m not a religious person myself, but I greatly respect those who are. My favourite composer – J.S. Bach – composed many of his (and perhaps Humanities’) greatest works to the glory of God, after all. When Carl Sagan proposed a placing a (vinyl-type) record aboard the interstellar-bound space-probe to the outer planets, Voyager 1, he asked for musical suggestions and an eminent biologist famously responded, ‘I would send the complete works of J.S. Bach … but that would be boasting’. In the event, the ‘Voyager Golden Record’ did include several of JSB’s compositions, including the first movement of a Brandenburg Concerto. When you think about it, the Golden Record suggests Sagan’s confidence that there must be life out there – and intelligent life at that – to receive and appreciate it. Looking back, it was a wonderfully optimistic, even naïve thing to do – an act of faith. I’m not sure NASA would do the same today. A few years back I sat down to dinner with my oldest friend, Fred, who is a physicist and a disputatious kind of chap. Fred and I almost always get into the kind of ‘lively discussion’ our wives call arguments over dinner (check-out Wendy Cope’s oh-so-true poem ‘Men and their Boring Arguments’). On this occasion, we ended up arguing about aliens. Fred and I fall on opposite sides of the ‘is there life in the Universe’ debate. For Fred is a believer in ‘Rare Earth’ (an idea expounded in a famous eponymous book) – the idea that, for various reasons, there is something special about our planet that makes it uniquely suitable for life. Meanwhile, I tend to the Copernican view that there is nothing very special about Earth and that if we discount some kind of creation myth then the Universe must be teeming with life. ‘Your belief in aliens is basically religion,’ he said, with a sneer. Ouch. You see for a professional scientist like Fred, the surest, most insulting way to rubbish a quasi-scientific opinion is to call it a belief. In fact, of course, both our opinions amount to ‘belief’ because there is no proof either way … yet. Anyway, his accusation didn’t sting quite as he’d intended. I don’t think belief is such a bad thing. I recalled Sagan’s Golden Record and Mulder’s poster in the X-Files basement, his slogan for my one of my favourite TV shows. Perhaps indeed I wanted to believe in universal life almost as much as Fred wanted to be unique and special. In the years since our ‘mens’ boring argument’, however, the evidence has started to mount and not, I have to say, in Fred’s favour. The search for exoplanets has already yielded up a number of potentially habitable worlds, whilst Earth-bound biology has steadily pushed back the boundaries of ‘habitable’ by finding life in all sorts of unexpectedly harsh places. Then, yesterday, came another piece of evidence to cheer Sagan and Mulder. At the bottom of the news, below much more important stuff such as a huge U.S. bomb and Kylie Jenner’s Prom, came NASA’s announcement that they had found the final piece of circumstantial evidence for life in a very unlikely place – Saturn’s moon Enceladus. 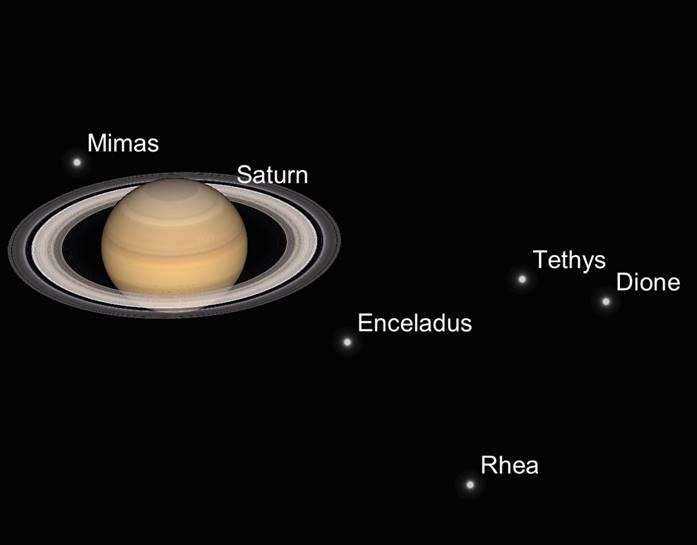 Saturn and moons, much as I saw them from the 60” at Mount Wilson – one of the largest telescopes you can look through. I got a good look at Enceladus through the 60” at Mount Wilson last year. Through even the largest telescope it’s just one of several star-like moons that cluster around magnificent Saturn. Those Voyager missions didn’t discover anything much more. But when the Cassini space probe (built at JPL, just a mile or two from Mount Wilson) began investigating Enceladus a decade ago, it became clear the moon was not the dead snowball we had imagined. Enceladus has water jets erupting from below its icy crust from active regions named ‘tiger stripes’, perhaps from some kind of sub-ice ocean (or at least large bodies of water of some kind). Cassini has sampled those jets over several close fly-bys and discovered interesting compounds typical of deep-ocean environments where life on Earth clusters around geothermal vents, separate from the rest of the biosphere and with no need for sunlight to make food. Cassini has previously found methane, carbon dioxide and ammonia. Now it has detected molecular hydrogen. The discovery of a simple and universal (most of the universe is made of hydrogen) gas spewing out of Enceladus may not seem a big deal. Certainly, the BBC, who buried the story, didn’t think so. But hang on. You see, the life found on Earth around deep-sea hydrothermal vents depends on a food chain built on bacteria that glory in the name ‘chemo-litho-autotrophic-hyperthermophiles’ (best sung - in place of Mary Poppin’s ‘supercalifragilisticexpialidocious’) that use chemical energy rather than sunlight to produce food. And those bacteria, thought by many to be similar to Earth’s earliest life, can use hydrogen as an energy source by combining it with carbon dioxide to produce methane. Let’s be clear, NASA’s announcement isn’t the discovery of life at Enceladus. That would have made the front page. Though the hydrogen could be a bio-marker, it could just be the result of inorganic reactions between rocks and hot water. The point is that if Enceladus did support life based on methane-producing bacteria around deep-ocean vents like the ones on Earth, NASA have now detected all the markers they would expect to: methanogenic bacteria could exist in Enceladus’ sub-ice ocean. This Easter, amid all the depressing stories about Trump’s giant bomb and sabre-rattling in the Pacific, it’s harder than ever to believe in the redemption of humanity. Bach’s great Mass in B Minor ends with one of the most redemptive pieces of music I know, set to the exhortation ‘Dona Nobis Pacem’, ‘give us peace’; but it doesn’t seem like anyone up there is listening just now. Then again, my own ‘religious’ (Fred’s words) desire to believe in something ‘up there’ just got a bit stronger with what may prove to be a momentous piece of Easter news from beyond the rings of Saturn. 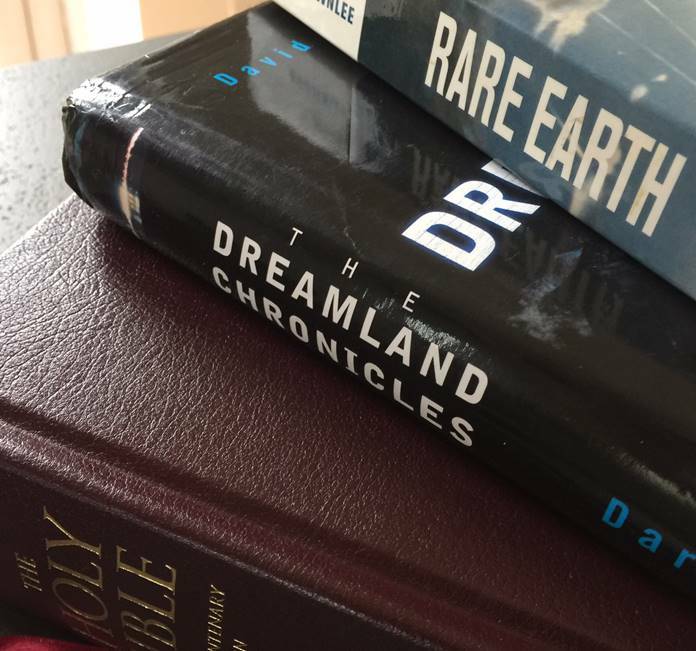 A trinity of books about beliefs: the King James Bible, a history of Area 51 and Rare Earth.